Forest City Fashionista: Fur Real? 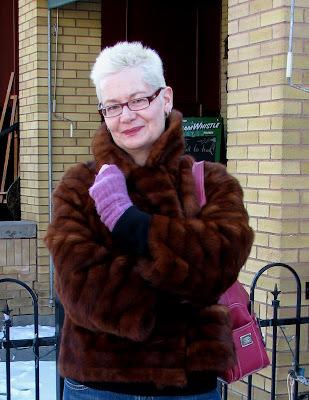 Yes, it's me, in a fur coat, and it's real fur, mink, I believe. Anyone that knows me knows that I love animals, have rescued a number of strays in my lifetime, and do not advocate the killing of animals for their skins unless you're living in the arctic tundra with no other way to keep warm. That being said, I also believe in recycling, and buy a lot of my clothing at secondhand stores. This jacket was $25 at a charity shop, and after keeping it in my closet for a year, to the point where the fur was starting to dry out, I decided it deserved better than that. I like to think the previous owner had some fun while wearing it (her initials, EDW, are in the coat), and it's still got some life in it, so I decided to stop treating it like some sort of politically incorrect precious object, and wear it as much as I can. Better to be loved a little longer than relegated to landfill. Very well stated!! I feel exactly as you do about fur and I think you are completely right that it is not beneficial in any way to trash it or hide it. You are actually showing a lot of respect. Good for you! Great Pic! I've always said...that if I eat the animal, I should wear the fur! !